On Sunday, October 8th, I ran my third full marathon in Portland, Oregon. I had one main goal with this race—to run a sub 4:00 marathon. While that didn’t happen, I came pretty close and ran my most successful marathon to date. I can honestly say that I’m proud of how the race went and have a new love for the distance. Worked with a coach. I worked with Emily Sanone last year when training for the St. George Marathon and had such improved results from my first marathon, so I hired her again to help me train for the Portland Marathon. Having a coach has made a huge difference in my running. I'm not totally comfortable with the marathon distance yet, so having a plan tailored specifically to me and my goals is so beneficial. It's also helps with accountability. Trusted my training. Every training cycle is bound to have a few hiccups—whether it’s a run where you feel off or not hitting certain paces in key workouts—but for the majority of my training, I felt strong. I surprised myself this training cycle by hitting all of my target paces in every track workout and running my three 20-mile long runs better than I ever have (in training for past marathons, I’ve struggled with the 20-mile runs). This time, I worked on keeping my speed up during those long runs and learned how to push on tired legs. Didn't stress too much. I perform better when I don’t put so much pressure on myself. I did have that 4:00 goal lingering in my mind as the date grew near and felt confident about it, but didn't let that goal overwhelm my thoughts. I now go into races thinking about why I love running and to race for the joy of it. I’m more likely to run my best race that way. The Portland Marathon snuck up on me. Because I didn’t obsess over it and knew my training had been going well, I felt relaxed and ready. Before I knew it, it was race weekend and I was flying out to Portland on Friday night. It's only when I landed in Portland that I realized how close the race was and began to feel those tiny butterflies. I was more excited than nervous though. We took a Lyft to the hotel where we checked in, picked up our race packets and browsed the expo. We had a late dinner at a nearby vegetarian restaurant and headed to bed, ready to explore the city the next morning. On Saturday, the day before the race, we walked all over downtown Portland, ate pasta for lunch at Pastini Pastaria (I had the pesto), explored the local shops + Pearl District and grabbed groceries for our race day breakfast. Portland is such a walkable city; we loved it. I lost my credit card on this day too, but retraced where I had last used it and luckily, found it at the restaurant we ate lunch at (so grateful the waiter returned it and kept it safe!). After relaxing at the hotel for a bit, we headed back out for dinner at Marukin Ramen, took a quick look at Nike Portland and then it was back to the hotel to prepare for race day. I got all of my gear ready and felt oddly calm as I fell asleep. Race morning began with my usual avocado toast and nuun for breakfast. I got dressed, stuffed my energy chews in my pockets and we headed out the door at 6:15 a.m. The weather forecast had been changing all week and on race day, it ended up being overcast, in the 40°s with a small chance of rain. I wrapped myself up in a heat sheet as Geof and I walked toward the corrals. What's different about this race was that there was no gear check, so I was thankful that Geof had that heat sheet in his bag. It helped regulate my temperature and kept me warm before the race began. Geof and I parted ways (he was in wave B and I was in C) and had a thirty minute wait until the race started. I lined up just ahead of the 4:00 pacers and ditched my heat sheet as our wave walked toward the start line. They counted us down and we were off running! I felt so calm from the get-go. I settled into what I felt was an easy pace and my plan was to keep my mile splits around 9:00 min/mi or faster. In the weeks leading up to the race, they announced a course change and instead of a looped course, it was switched to an out-and-back. I wasn't sure how I felt about that. I like experiencing and seeing new surroundings throughout a race and didn't particularly love knowing that I'd have a large amount to run back when I hit the turnaround point (although, it is kind of cool to see the lead runners and how effortless they look when they were headed back). The first few miles took us through downtown and an industrial area. I felt a little chilled at the start but that's exactly how I wanted to feel. The cool weather and flat start made it very easy to settle into a comfortable pace. 3 mi—26:19. At mile 3, we made a u-turn and headed back in the opposite direction, making our way through the streets and up a long, straight stretch of road. 6 mi—52:28. The next miles on the straight were all along a highway by Forest Park. This led up to the first real hill of the race, a steady climb up to the St. John's Bridge. I was remaining steady and felt confident in my ability to hold my pace. After crossing the bridge, we headed to the Willamette Bluffs. There were more spectators lining the streets and I loved feeding off of their energy. It began to rain and I got a little colder. Geof and I saw each other at mile 13 as I was headed toward the turnaround point (and as he was headed back from it). We gave each other a high five as we passed and that gave me a little boost. 13.1 mi—1:56:08. After the turnaround at mile 14, I had a renewed bit of life after seeing Geof and knowing I was headed back the way I came and would be getting closer to the finish. The rain stopped and I was still feeling good and running consistently. 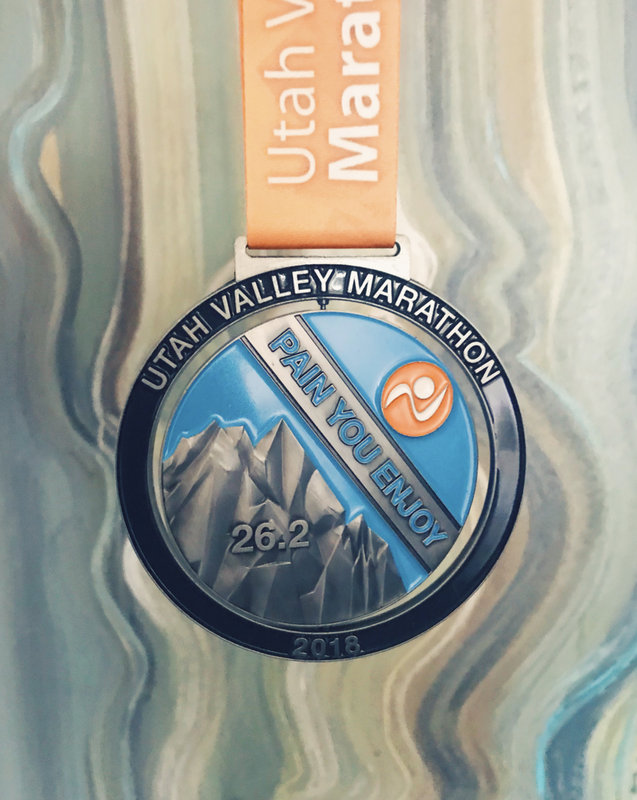 I found a new running mantra recently that perfectly describes how I felt up through this point of the race: run your happy pace. And that was what I was doing. 17 mi—2:32:15. As I made my way back over the bridge at mile 18, I began to feel the first bits of tiredness in my legs but it wasn't bad at all. It was easy to block it out of my mind and keep running. At mile 19, as I was going downhill after the bridge, I felt a little twinge in the side of my right knee and knew my hip was getting tight. I told myself to stay on track and ran through the pain that was beginning to form in my knee. As I got into mile 20, the small jolts in my knee were increasing and I ended up taking my first walk break of the race. I looked at my watch, knew I was still on target and after that lackluster 20th mile, I was determined to push forward and reel it back in. I was able to stay on target pace through 21 miles. 21 mi—3:09:58. It became harder to hold my pace after that. I had a few more small walk breaks but every time I checked the progress on my watch, I noticed that I could still do a 4:00 if I were able to keep a 10:00 min/mi pace. I tried so hard but this is where my race started to fall apart. This is where I hit the wall. It just came out of nowhere. Suddenly, my legs felt heavy like lead and I couldn't turn them over as fast anymore. The stabby pains in my knee went away but were replaced with an overall sense of fatigue in my legs. The 4:00 pacers passed me at 23 miles or so. I tried to keep up with them but eventually they were out of sight, so I willed myself to keep my legs moving quickly. It was difficult. The last few miles were a blur. The 4:00 goal slipped through my fingers as I made it back into the city. I rounded the last turn and as I ran down the finishing chute, I picked up the pace. I crossed the finish line with such a huge sense of relief and accomplishment. Even though I missed the sub 4:00, I still ran a marathon PR and I was happy about that. Final chip time—4:06:17. My watch read 26.49 miles at the end. I believe that was due to the GPS losing signal in some of the tall buildings downtown and from me not running the corners as well as I could have. As I walked through the finisher's area, I received my medal, a cover-up jacket, water, chocolate milk, fruit, a rose, tree seedling, shirt and a medallion coin. I reunited with Geof in the finisher area and we chatted about how our races went (he ran a 3:50:07), took photos and walked back to the hotel to relax. I was initially so proud of how the race went (a 12 minute PR is huge for me!) but as I reflected on it the next day, I began to feel sad about missing the sub 4:00 time. I was also invigorated at the same time. I know I can get that sub 4:00 and I'm coming for it next year. Run for fun. The Portland Marathon was my big race of the year and now that it's over, I can unwind a little and not worry about having to follow a regimented training plan. I'll run less each week (maybe just 3-4 times instead of 4-5) and can get back to running more on the trails and running more with my dog. Cross-train consistently. I didn't do the best job at cross-training this marathon cycle. I did yoga and pilates a few times but rarely went to the gym, even though I know I need to. The only way for my legs to carry me past a marathon distance is for me to get stronger in my glutes and hips. That starts with more regular, quality cross-training. For the rest of fall and winter, I'm going to refocus on gaining strength so I'll be ready for more running and races in the spring. It'll also make me a more powerful, balanced runner. Do you like to travel for races? What are some of your favorite marathons?